When teams are new to Slack, they often use it solely as a communication channel. It quickly becomes the place to talk about current projects, plan the upcoming weekend, and remind the team when coworkers are going to be out of the office. And sure, conversing in Slack like this helps keep everyone in the know, but you’ll find the everyday utility of Slack is much higher when you use it for collaboration. That starts with migrating common work tasks into your workspace—and what’s needed more frequently than feedback? 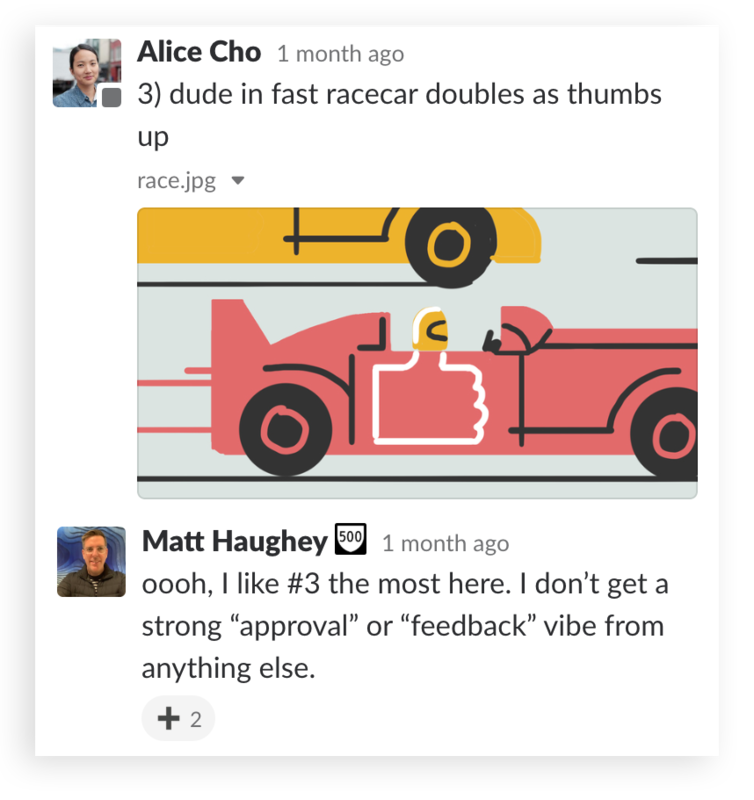 To make feedback requests go faster and smoother, here are a few ways teams can ask for it, and obtain approvals, straight from Slack. Getting sign-off on small deliverables doesn’t have to be an extensive, formal process. For any company with a social media presence, simply sharing proposed tweets and asking for feedback in a #social-media channel is an easy solution. Ask for changes or rewrites in a thread, and count getting a 👍reaction from a manager as approval to post. Once you start using this kind of lightweight process to get a few eyes on work before it goes out, you might find yourself asking for feedback and approvals more often when they’re quick and easy each time in Slack. If you’ve ever worked with designers, you know the typical cycle for most design projects. There’s a design brief outlining the work needed, and then there are initial mockups that are discussed and further finessed into the final deliverables. It’s easy to move that process into Slack. Create a #design-briefs channel, where you can pin a sample design-brief document outlining all the information the team would need to consider with a new request. Ask people to copy the sample and upload and post their new brief in the channel, where design managers can review it, request necessary clarifications in a thread, approve it, and schedule the work with design staff. Reviewing mockups is a simple process in Slack. Mockups can be posted to group direct messages with everyone involved, posted in design channels, or posted in a channel set aside for a project. Mockup reviews can be discussed in threads, where everyone can leave comments on any tweaks they’d like to see. Approvals can happen in messages or even with a quick ✔ emoji reaction to move a mockup to the next round. After all the design iterations are complete, final deliverables can be uploaded to appropriate channels, where the team can take the work and incorporate it into their project. We frequently see software development teams use Slack channels to discuss issues and approaches around projects in the general sense, while sticking with built-in tools in their code repositories and version control systems to track bugs, issues, and updates. Many such tools can report back into Slack, keeping a whole team up to date. 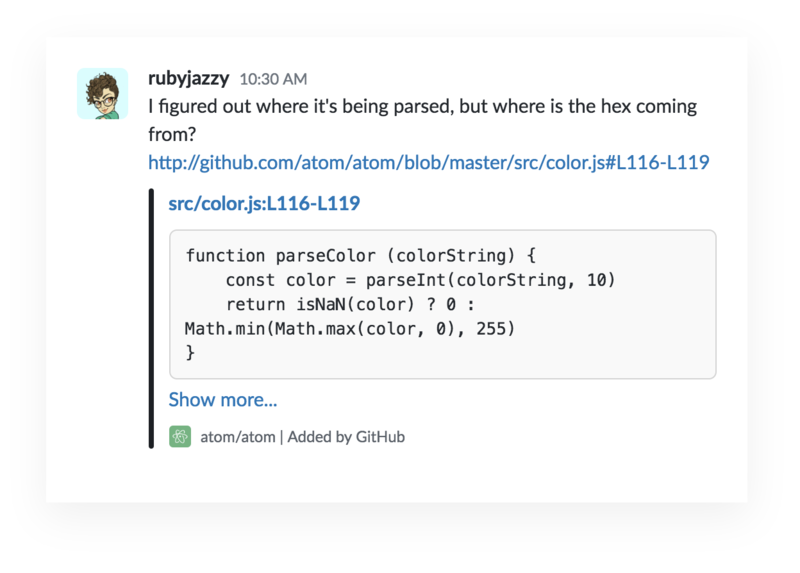 For example, GitHub’s app for Slack can alert team members when new pull requests are made, when issues are closed, and when code is ready to deploy. The developer apps category of the Slack App Directory has dozens of other popular options, including BitBucket, Jira, Jenkins, and more. The next time your team has a big presentation coming up, try using a Slack channel to organize the high points, give feedback, and suggest new slides together. 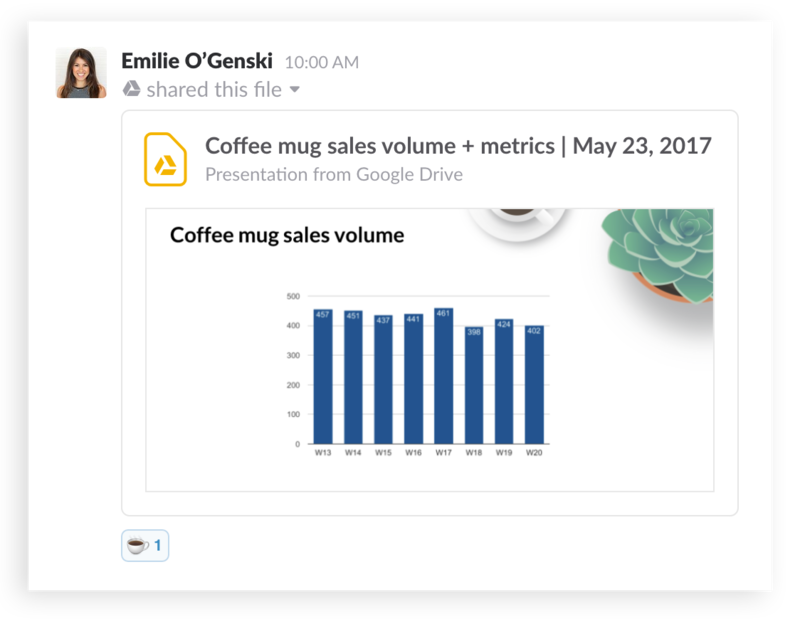 Google Drive’s bot can let you know when others make comments, changes, and suggested edits to your Google Slides documents while also furnishing previews whenever the slides are shared in Slack. Channels and threads are where you can discuss larger topics surrounding a presentation and brainstorm any new slides needed. When the work is finalized and ready for the big day, sharing your final Google Slides in-channel means there won’t be multiple versions to keep track of, nor files to lose, plus the slides will be available in search when anyone needs to reference them in the future. 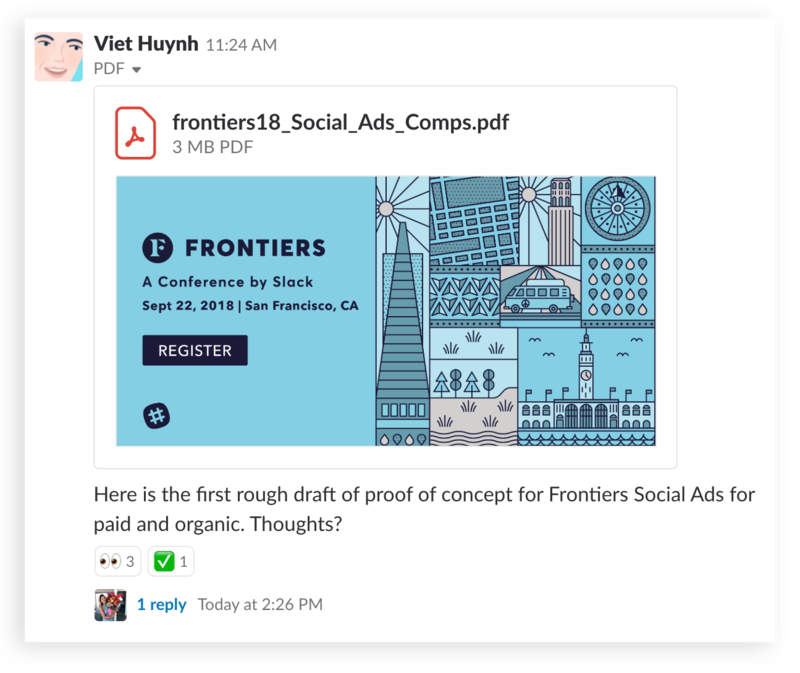 The work of content teams is a natural fit for Slack, especially when you consider that regular publishing requires several rounds of feedback at multiple points in the process. This very post started as a pitch in a #content-pitches channel, where the idea was discussed and fleshed out and then approved and scheduled on a publishing calendar. A Google Doc draft of this post was added to our #content-blog channel, where an editor and a copy editor took passes on it. Artwork was arranged in a #content-art-direction channel, where a freelance artist posted several ideas as quick sketches before a favorite was picked and the artist uploaded his final version days later. Once everything was ready, our content manager scheduled its publication in the aforementioned blog channel, sharing a link to preview it on a staged server. Once your team has gotten the hang of it, getting approvals and feedback on work can extend to others beyond your company. Shared channels in Slack let you create a channel that bridges two different workspaces, making it possible, for example, to have your company’s architect upload blueprints and drawings in a #construction-project channel. You can collaborate with a design firm on your company’s new logo in a shared channel, where various ideas and rounds of mockups can be shared and tweaked before being finalized and delivered. 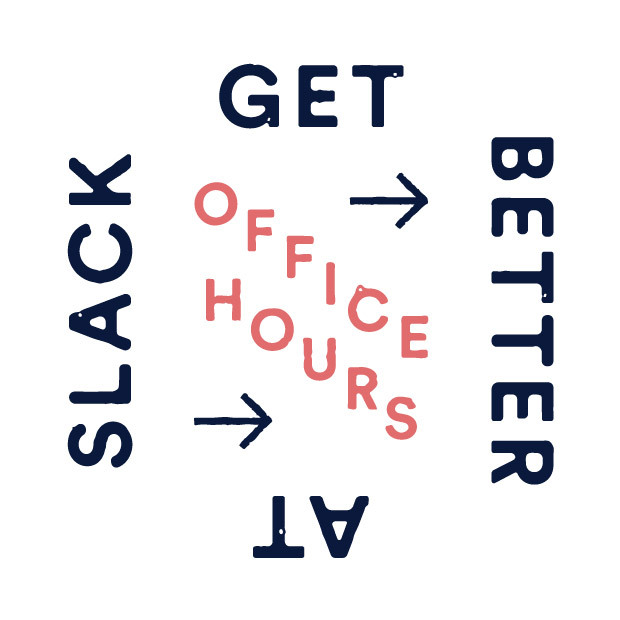 Slack is great at being a light and fast way to communicate with people, but, like a Swiss Army knife, it’s also flexible enough to be used in multiple ways. Once you start moving more of your work into Slack, you’ll find that the same ease of use and speed benefits from communication will extend to other operations.